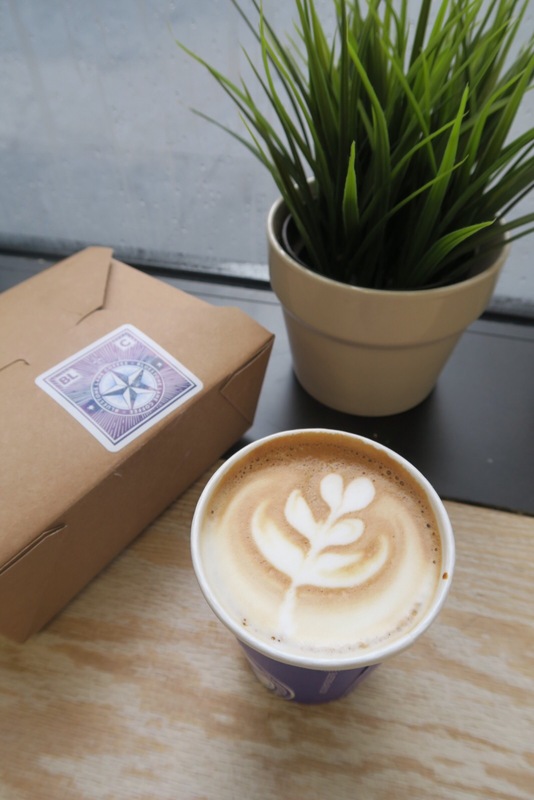 While it can be challenging to stay healthy in the city that never sleeps, I’ve found some great spots to frequent that deliver healthy and delicious eats. Here are some of my favorite spots, plus tips for a quick dinner if you want to cook. This is my What I Ate Wednesday: Healthy in NYC Edition. You know that whole “But First Coffee” thing going around? That is literally me. While I love being awake early, actually executing the early waking can be a bit of a challenge. Luckily for me, I have a coffee machine that I can set the night before. 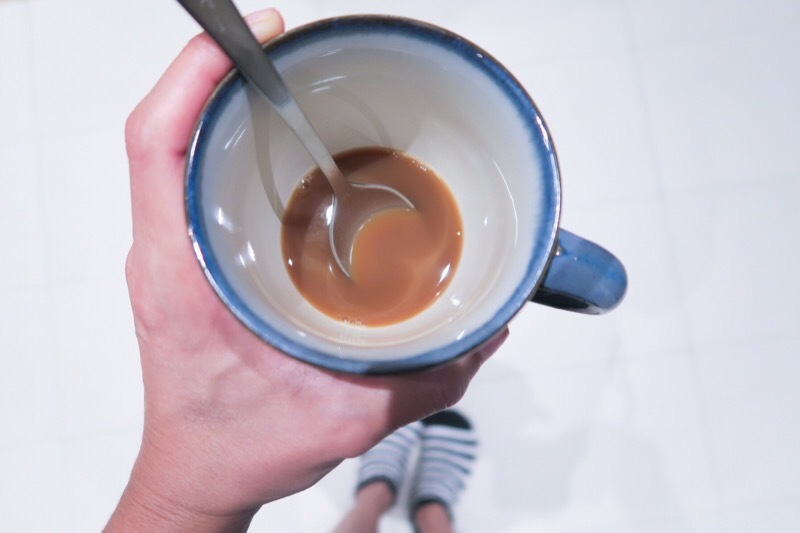 The next morning, I stagger to the coffee machine with the sweet, sweet smell of roasted coffee beans wafting through the air. It’s the only thing that gets me out of bed in the morning. I’ve been experimenting with various non-dairy milks in my morning coffee over the last few years. I’ve found that the types of non-dairy milk seem to matter less than the brand. And I don’t mean by fancy versus affordable. Not sure if anyone else has been through this game, but I can share my findings with you if you’re interested. Let me know! I recently switched to an earlier schedule at work. Foolishly, I thought my evening schedule would naturally adjust to accommodate waking up earlier. It has not. Because of this (and okay, maybe some laziness, some love of enjoying local spots while I still can, and plenty of other excuses I can’t think of right now), I’ve gotten into a habit of getting breakfast out during the work week. On this day, I went to one of my favorite spots, Bluestone Lane. They have a really delicious avocado toast, and their coffee is like rocket fuel. If you want to really wake up, go here. 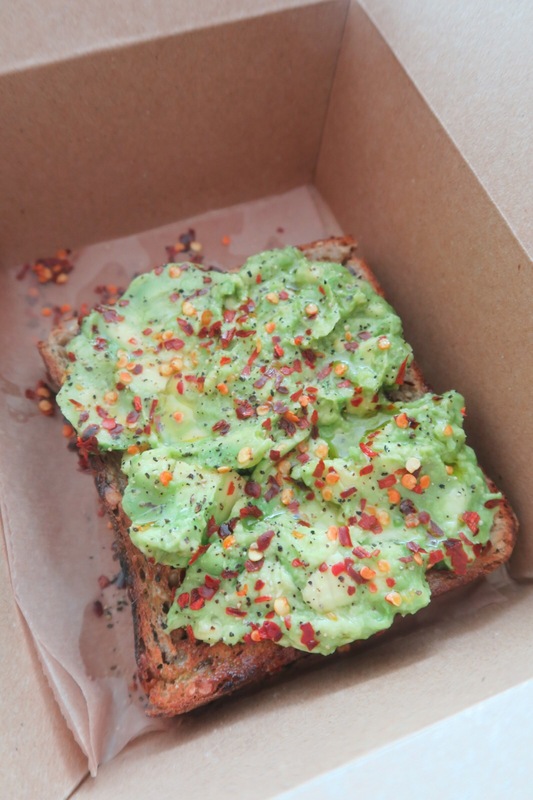 The avocado toast is fairly pricey (around $8 for the basic version). But, I feel like you get at least half, if not one whole, avocado on top. I like the way they simply mash theirs with (what tastes like) lemon juice and maybe salt and pepper. They sprinkle a hefty dose of red pepper flakes on top. The amount is more intimidating by looks than it really tastes, though I do sometimes have to scrape some of the flakes off. With a light hand, I can save most of the avocado mash still. And here’s my absolutely favorite go-to. The one. The only. Dig Inn. As you guys know, I’m not much of a salad person. At Dig Inn, I can get a healthy, *hot* meal for less than $10. In NYC! That’s crazy good. Dig Inn sources some ingredients locally, and they also try to maintain a seasonal menu. So, they’re often switching things up. Today I got a market plate with a brown rice base, charred chicken, kale, and zucchini/squash. And because it was hot (and I noticed a sign at the check out saying they make their lemonade in house), I opted for a lemonade. I was happy to taste that the lemonade was only lightly sweet. If you’re ever in town visiting and want healthy food fast, check out Dig Inn. There are many locations throughout the city. I actually visited this particular location just the week before and left my S’well water bottle. If any of you have one of those, you know that they are not cheap. I was busy doing some travel home, so I didn’t call for a few days, but even just over a week later, they still had my water bottle. Woop! Thank you, Dig Inn, for keeping my water bottle safe for me. I already liked you guys, but I like you even more now. I’m currently planing a charity Zumba class to celebrate my 10 year blogiversary. The event will benefit my friend Annette’s charity fundraising efforts. And she’ll be doing a guest appearance and leading some songs at the class! You may know her from the Britney Spears dance classes I’ve been doing all year. Or as my roomie from this year’s Zumba Convention. Anywho, we met just before her class to talk about the event and work on some of the final details. I’ve been wanting to try her Latin Burn class for awhile now, so I took the opportunity to stay after our meeting to dance. Annette actually teaches her class in heels. Get it, girl! I will be telling you guys more about it when I do my August Class Pass Recap. But it was a sassy, fun time! Class was 7-8pm, so a bit on the later side. I opted to have dinner after class since I can’t eat much more than a light snack too close to class time. Especially when the class is very cardio-heavy. As I left Latin Burn, I wondered if I should swing by Westville and get take-out or cook. I decided to make one of my homecooked-ish meals. Maybe I was hungry, but I forgot to take photos of it. But, I made my dill baked salmon and picked up two pre-prepped sides from a nearby grocery store. One of the sides was a cold, bok choy salad with sunflower seeds and dried cranberries. I ate this while the salmon cooked. The other was roasted baby potatoes that I added to the salmon sheet tray in the last 5 minutes of cooking. As I mentioned on my Lemon Baked Salmon Recipe, I’m hoping to make more of these one sheet wonders. Without needing to scrub pots and pans, clean up is a breeze! And I should probably do an updated version of the dill salmon since I’ve been doing it slightly differently than the recipe I linked above. 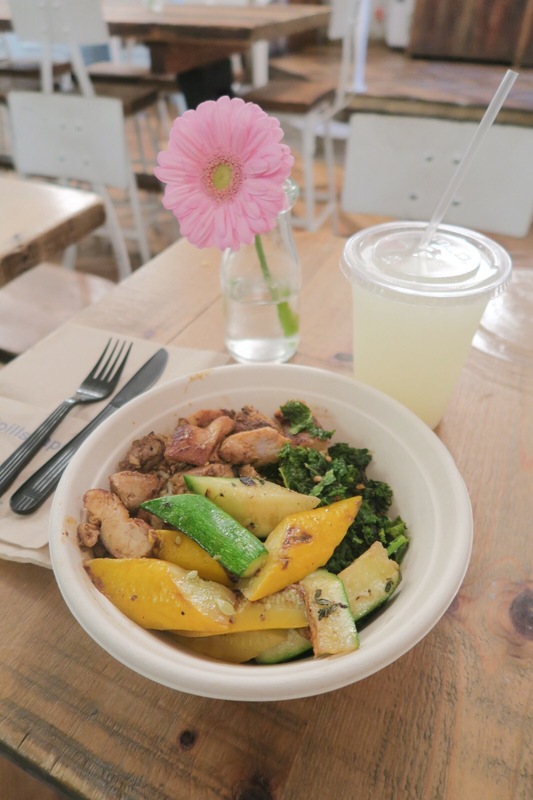 Hope you enjoyed this What I Ate Wednesday: Healthy in NYC Edition. Sorry this is not being posted on Wednesday. I was so tired after the long day that I forgot to post it that day, and I’ve been working/traveling home since. The post was drafted yesterday, but I was blogging offline and having challenges with my software. Had to put the finishing touches on it after work today. But this is what I actually ate on Wednesday. Also, I’m going to see if I can put together some giveaways for my 10 year blogiversary. Stay tuned for details! Thanks for stopping by!